SOYBEAN AND EXTRA VIRGIN OLIVE OIL, WATER, FETA CHEESE, VINEGAR, RED WINE VINEGAR, SALT, BLACK OLIVES, ONION & GARLIC POWDER, GLUCOSE-FRUCTOSE, POTASSIUM CHLORIDE, SPICE, HYDROLYZED SOY PROTEIN, LEMON JUICE CONCENTRATE, XANTHAN GUM, POTASSIUM SORBATE, PROPYLENE GLYCOL ALGINATE, NATURAL FLAVOUR, LACTIC ACID, FERROUS GLUCONATE, CALCIUM DISODIUM EDTA. Contains: SOY, MILK. A delicate blend of vegetable and olive oil, sweet red wine vinegar and fresh lemon juice. It is classically flavoured with oregano, garlic, onion and black pepper for an authentic Greek profile. The Hellmann's name is recognized throughout the world for unrivaled quality and flavour. 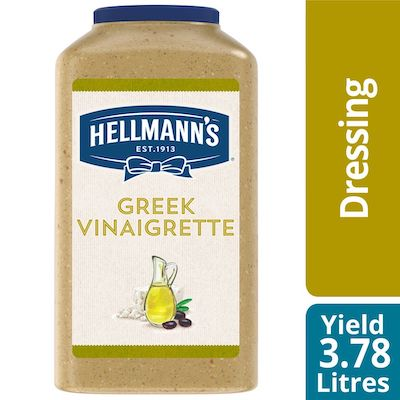 Hellmann's Greek Vinaigrette Salad Dressing offers premium quality with shelf-stable convenience. This gluten-free salad dressing is also versatile, with alternative applications ranging from marinades and dips, to glazes and finishing sauces. Classic Greek salad: This peasant style salad in a true form has no lettuce. The ingredients are diced tomatoes, diced cucumber, kalamata olives and onion tossed in Greek vinaigrette. This is then garnished with finely crumbled feta.